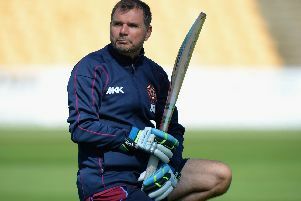 Head coach David Ripley was left ruing a lack of runs after Northants Steelbacks were beaten on the final ball by Birmingham Bears. Steelbacks could only make 146 for seven from their 20 overs, with Richard Levi’s 58 from 48 balls the main contribution. The Bears, who won the T20 competition last season, looked set to cruise home as William Porterfield steered the ship at the County Ground. But his unbeaten 55 was only just enough, with the champions needing four byes from the last delivery of the match to secure the win. And Ripley said: “We were short of runs, probably 20 because 160 is par score. It’s a decent batting wicket. “We fought hard with the ball and in the field and we almost pulled it out of the bag, but 48 dot balls, only a run a ball in the middle of the innings and a limp finish from us left us short and that was the difference. And he added: “Richard played well and we had a good powerplay. We were 47 for one at the end of that and were off and running. “There’s a lot of firepower in our batting line-up but we’ve talked a lot about not leaving it to each other. We don’t want that, people have got to stand up and see us through.